The LD310 Series has been discontinued, please see the LD320 series as a possible substitute or consult OMEGA's Pressure Engineering department. 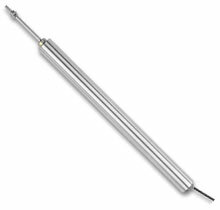 The LD310 series is an economical ac LVDT available in stroke lengths from ±1.5 to ±250 mm (±0.06 to ±10"). It features a guided core with standard spring loading. For applications requiring a free travel, the spring can easily be removed in the field. The LD310 series is compatible with a wide variety of instrumentation including digital displays, signal conditioners, and data acquisition systems.